We recently attended the annual ASPS National Plastic Surgery Meeting in Toronto. There’s one panel session called ‘Hot Topics’ that gives an overview of the most exciting emerging technologies and surgical techniques in the plastic surgery landscape. This year a total of 29 plastic surgeons presented 5 to 10 minute presentations over a continuous 5 hour stretch. These topics included discussion of new lasers such as the Zelique and Zerona, Shock Wave Therapy for Wound Healing, Technologies Not Available in the US, and Fat Grafting to the Breast among other topics as well as two notable presentations on Adipose Stem Cells. 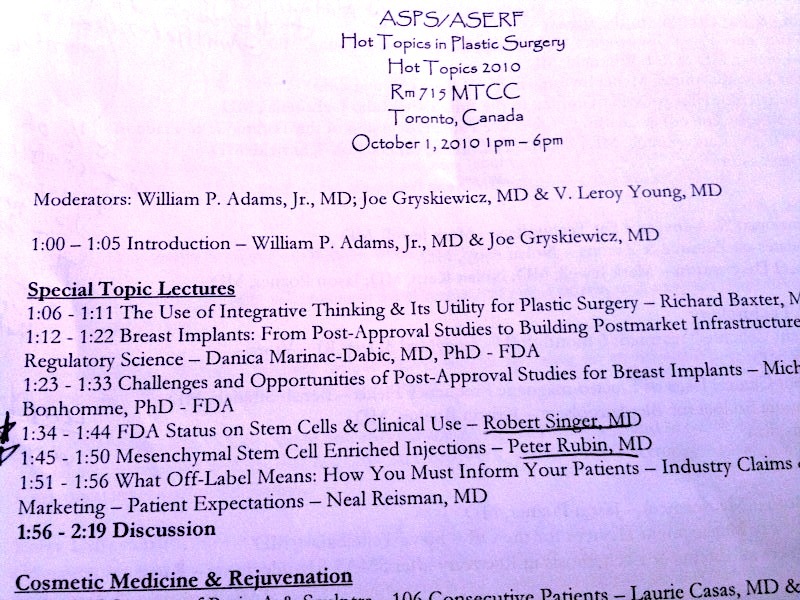 The stem cell presentations were made by Plastic Surgeons, Dr. Robert Singer and Dr. Peter Rubin. Dr. Singer is on the New Beauty Magazine Advisory Board, and Dr. Peter Rubin founded the Institute of Regenerative Medicine at the University of Pittsburgh. Just as notable as the actual scientific presentations was the media coverage of these panels. The Toronto Star published a news article October 4th that detailed a summary of the two stem cell presentations called, Beware of cosmetic promises, plastic surgeons say. The article began by making reference to ‘snake oil’ and then babbled on with misquotes from the two presenters. The news article was so riddled with inaccuracies that I even wondered if we had gone to the same presentations. To make matters worse, the article got quoted and reprinted by other publications such as Plastic Surgery Practice, not to mention lots of other blog writers. With each day, the misquoting got more jumbled and quotes from Dr. Singer and Dr. Rubin were mixed up into one gigantic negative spin. With the upcoming and very positive cover story article on Tissue Engineering (with adipose stem cells) by Sharon Begley in the November issue of Wired Magazine, we decided to come public with our own summary of the presentations, to help set the record straight on what was said at this Hot Topic Panel Discussion on Stem Cells in Toronto. Dr. Singer started his presentation stating that adipose stem cells were ‘The New Frontier of Plastic Surgery” and outlined the two regulatory categories that the FDA uses to classify procedures involving adipose stem cells: drugs/biologics vs. tissues. Likewise, he detailed that if adipose stem cells are reinjected in a second operative session, the FDA has not yet ruled whether they are a tissue or a drug. Dr. Singer stated that all stem cell selection devices would fall under the ‘drug’ category and that none of them have yet received FDA approval in the USA. He discussed in detail what constitutes a ‘drug’ in the FDA world. He informed the audience of plastic surgeons that anything deemed ‘a drug’ would need IND approval and ‘pre-market’ clearance by the FDA. Dr. Singer launched into an attack against plastic surgeons who are advertising and promoting adipose stem cell techniques such as the ‘stem cell facelift.’ To be sure — this was not a hand slap — he took them out to the woodshed. He not only named names, he posted them up on the large projection screen and then detailed the types of promotions these surgeons were using. His list included a GYN promoting seminars for techniques in performing stem cell breast augmentation, as well as board certified plastic surgeons ‘promoting’ adipose stem cell procedures. How do we get the stem cells out of the fat?We first need to do a mechanical extraction of the lipoaspirate, centrifugation, do an enzymatic separation of the stem cells with collagenase, get a stromal vascular fraction pellet, and then (if we are culturing) plate the cells out. What is stem cell enhanced fat grafting?This is mixing in the stromal vascular fraction pellet with the regular fat graft. The fat stem cell is a population of mixed cells with different pheonotypes. Does stem cell enhanced fat grafting work?Yes – stem cells participate in angiogenesis, release VEGF, and induce vascularization. Do you get improvement in regular fat grafts?In my lab with animals – YES. We get improvement in fat graft retention. In humans – we need more data. The Japanese have done hundreds of patients and have a cohort study, but we need more data. Is it safe?Yes – there have been very few reports of adverse affects in both animal studies and human cohort studies. What about cancer risk?There is very low risk of malignant transformation. However, there was a concern as to whether adult stem cells could promote the growth of existing cancer. Last week we released our findings about this. We did an in vivo (in the body) animal study which showed that only active dividing cancer cells are impacted. Quiescent cancer cells (dormant, remission cells) are not stimulated to grow with adipose stem cells. (See our blog post about Dr. Rubin’s study). Can you do this therapy in your own practice?There are two ways that stem cells are regulated 1) tissue grafts and transplants 2) biologics – under section 351 of PHS Act– these do need approval from the FDA. The whole crux of the difference between these two is whether the cells are more than minimally manipulated. However, there has been no general ruling by the FDA yet. You can do it as a tissue but you either need a certified laboratory environment or a point of care device. What am I doing now?Right now we are doing a clinical study at University of Pittsburgh for fat grafting to the face with stem cells. We need to continue gathering data. Where to learn everything you want to know about adipose stem cells?If you want to learn more about stem cells from fat come to the IFATS 2010 meeting in Dallas on Oct 21! To be honest, we initially didn’t fully comprehend the “woodshed” part of Dr. Singer’s presentation. It was so overpowering that the underlying message was diluted. Fortunately, we had flawless notes ;-). Upon rereading our notes –word- for- word– it became clear that Dr. Singer was telling plastic surgeons that ‘promoting’ stem cells was giving the FDA more leverage to define minimally manipulated adipose techniques as a drug, and not a tissue. Adipose stem cells are in a very delicate stage of the FDA regulatory process. The FDA is currently making the decision of whether minimally manipulated adipose stem cells are a drug or a tissue. The way this decision goes (tissue vs. drug) is going to materially impact REGENerative medicine and the future of plastic surgery in a profound way. In the eyes of the FDA, ‘promotional activity’ falls under ‘labeling activities’ and ‘labeling activities’ fall under the jurisdiction of ‘HCT/P 351 drugs and biologics.’ Since the FDA is still determining whether adipose stem cells are either a 1) drug/biologic or 2) tissue, Dr. Singer was advocating against any type of stem cell promotion or advertising because this type of activity gives the FDA more fuel to classify adipose stem cells as a drug. Since all fat grafting contains some adipose stem cells, an FDA classification of uncultured adipose stem cells as a ‘drug’ could create regulatory problems for plastic surgeons. Likewise, a ‘drug’ classification for minimally manipulated adipose stem cells would bring innovation to a grinding halt. Dr. Rodriguez and the team here have long believed that fat stem cells have the power to restore beauty, heal damaged tissues, and potentially treat and cure some diseases. To learn more about adipose derived stem cells please read our June 2009 blog post called Stem Cells from Fat: Plastic Surgery’s New Frontier or read other fat stem cell related blog posts. Truly inspirational, just like, “Any fact that needs to be disclosed should be put out now or as quickly as possible because otherwise … the bleeding will not end…”. Stem cells are pluripotent, meaning they can do many things. And yes they have a role in virtually all fields of medicine. Our practice now is very active in stem cell injections to the breast. Please be sure to reciprocate by linking to us at your website. It amazes me that stem cell research has found its way into every type of medical discussion. Plastic surgery is changing everyday. Please call the FDA and let them know. I agree with you completely. As a matter of fact let as many people know as you can about this decision the FDA is about to take. It will impact greatly the progress of stem cell development in the US and people will have to travel to other countries where the standards of care are not as great. How can an autologous substance be considered a drug? Fat transfer, and fat grafting have been around for decades. We are simplly using new knowledge about something that has been in our bodies from our very conception. Stem cells are not a drug, neither is the manipulation of them to encourage their specified growth pattern.